Gretsch G9220 Bobtail Review – Bringing the ‘20s Back to Life! 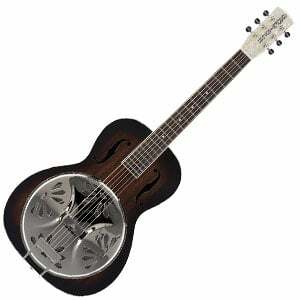 With their G9220 Bobtail, Gretsch aim to faithfully deliver the same sound and style of the early 1920s resonators, although with one major twist – it features electronics. At around $500, this roundneck spider cone resonator sounds like a good deal for performing musicians craving that sweet vintage twang. 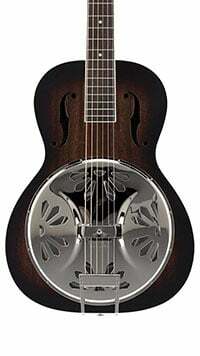 But does it truly deserve its place on our chart of the best resonators? Let’s find out! This Bobtail has huge retro charm, with a non-cutaway small body complete with a dark two-color sunburst paintjob and vintage semi-gloss finish. The appointments boost this vintage feeling even further, with aged body binding and two F-holes, while that Gretsch-branded pearloid headstock is just awesome. The body is made entirely of laminated mahogany, with a solid mahogany neck that features a classic rounded V shape, a padauk fretboard, and 19 frets in total (12 in the clear). With a 1.75” nut width, it plays beautifully – similar to an electric guitar, and perfect for slide and all styles of blues playing, although the squareneck version would naturally suit lap steel players better. From the box, it could do with a good setup as intonation and action felt a bit off, but the general fit, feel and craftsmanship of this Chinese-made instrument is solid. The Bobtail features Gretsch’s Ampli-Sonic hand-spun spider cone and bridge, which is handmade in Eastern Europe and shows great quality. It’s also fitted with a Fishman Nashville Resophonic piezo-ceramic pickup, which is specifically designed for spider-style bridges, and therefore fits the Bobtail very well. There’s a 1/4” output jack for easy amp connection, although there’s no preamp or onboard controls, so keep your amp close by for EQ tweaks. The rest of the hardware is great for the price, as it features a set of open-geared Grover Sta-Tite die-cast tuners with black buttons, which are consistent and stable. There’s also a good bone nut, as well as D’Addario strings. For the price, the Bobtail is well-equipped. The Bobtail may be a small package, but it delivers on big vintage tone, with a beautiful resonator ring that’s not overly buzzy. For the smaller body it has huge projection, and easily cuts through any acoustic mix. Playing for bigger crowds you’ll have to plug in, which is no problem as the amplified sound is accurate and consistent through the Fishman system. Gretsch’s G9220 Bobtail is a solid choice for any blues or vintage guitarists who wants the sound of a beautiful resonator at a price that doesn’t hurt. It’s certainly stage-worthy and, with its extroverted vintage appearance, it’s one that you don’t want to keep hidden in the bedroom. 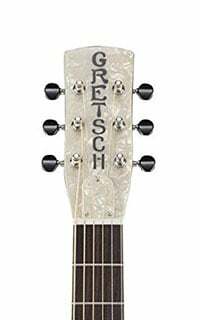 For more info about the Gretsch G9220 Bobtail, click here.